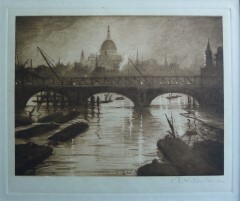 C.R.W.Nevinson, painter and printmaker.Born in London, son of author and war correspondent Henry Nevinson. Studied at St. John’s Wood School of Art 1907-08 and at the Slade 1908-1912. In 1912-1913 he attended Académie Julian whilst he shared a studio with Modigliani,worked at the Cercle Russe and made friends with Severini. 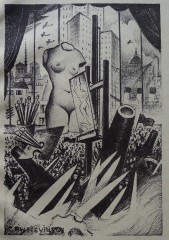 Interested in Cubism and Futurism, he was one of the first English artists to be deeply influenced by new developments in Europe at that time; his work was included in the Post-Impressionists and Futurists exhibition at the Dore Gallery in 1913, and he organized a banquet for the Futurist leader Marinetti in London in that year. In 1914 he became a founder member of the London Group and in 1914 issued a manifesto titled ‘Vital English Art’, with the futurist painter Marinetti. During the First World War he served in Flanders and France as an ambulance driver, he was invalided out of the army and became an official War Artist in 1917. His first solo show in 1916 was at the Leicester Galleries, another in 1918. He was elected to the NEAC in 1929, the RBA in 1932 and as ARA in 1939. His later landscape and flower pieces were gentler and less radical in design than his work before 1925.